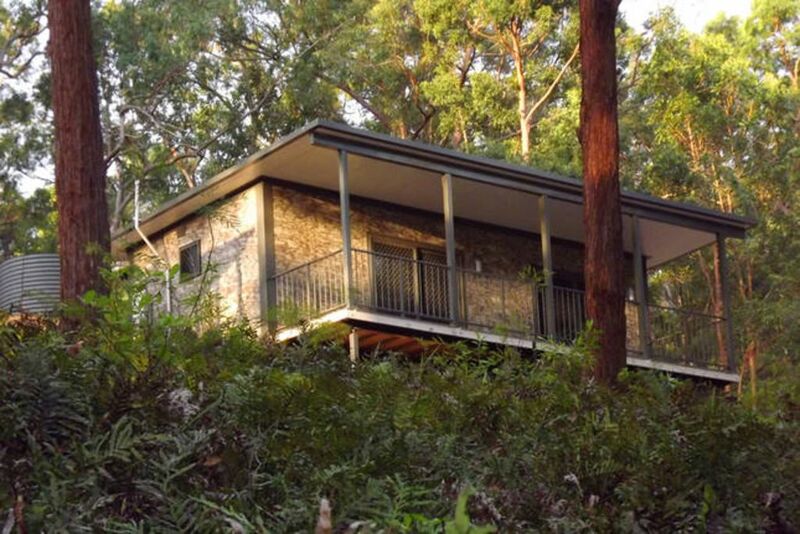 Open plan studio - tucked away in the Tamborine Mtn foothills. Pool, spa, BBQ. Wallaby Ridge Retreat expands its boutique accommodation with our brand new Bushland Retreat Cottages. Fern and Blue Crane offer a serene open plan option with the latest in technology, contemporary décor and our architect inspired cottage design will delight. Four star rated room inclusions: FREE Wifi, Smart TV with movies, sound bar, king beds, luxury linen and fluffy towels, robes, pool and spa towels. Designer insired touches in the bathroom and kitchen. Local artwork and nature inspires the interior decor. Whisper quiet Aircon, full gas hob and convection micro provide the perfect holiday cookery balance. A generous open plan living space of 36m2 and 18m2 of covered veranda elevated aspect to peek to peek at the local wildlife in the trees. BBQ facilities are covered and offer plenty of seating. Of course the outdoor heated spa and the inviting salt pool is refreshing in summer and calming to warm in the winter sun. Free carparking convenient to your door. Enjoy the attractions of the national parks of Tamborine, Lamington, Binna Burra or go a little further afield to Springbrook. Just 45 minutes to Broadbeach surf and the Gold Coast, its hard to believe it is all so close. Enjoy Movieworld, Dreamworld, The Outback Spectacular are all within a reasonable drive. Romance? Yes, you will find it here, peace and quiet. Why not order a cheese platter to be delivered at a time of your choice or enjoy some quiet time watching the sunset from the spa. Mobile Massage with day spa extras will come to you (prebook to avoid disappointment). We offer a child free environment and our Retreat is a quiet (and more budget friendly) alternative to busier and larger mountain Resorts. Adventure? Horseriding, fishing, bike riding, kayaking, 4X4, bushwalking, ropes courses, minigolf, Tamborine Skywalk, waterfalls and lookouts - we can happily help with more information on enquiry. Food and Wine? Enjoy a Wine tour with a local pickup service and a half to full day tour including lunch, or self guide with a local map that we can provide. Purchase local fruit and vege from local farmgate stalls or local villages. Enjoy a sumptuous lunch from one of our local wineries or enjoy a hearty evening meal at the local Canungra Hotel. We also recommend the local pizza shop who makes awesome pizzas. A varied list of community events, markets, local bands/entertainment, Sunday sessions occur in the area, just ask for more information. Canungra also has a comprehensive Visitor Information Centre. If nature is what you crave, stay here as a base to enjoy the most beautiful and accessible Heritage listed National Parks in Australia. The "Green Cauldron" is an opportunity to visit not only a diverse range of flora and fauna, but the scenery and geography is breathtaking with spectacular lookouts, waterfalls and imposing mountain features. John and Robyn are avid bushwalkers and enjoy being amongst nature. Wallaby Ridge is an ongoing project aligning the values of enjoying and preserving our natural environment for others to enjoy. Robyn's other joys including gardening, art and cooking, so to enjoy a stay on Wallaby Ridge is to enjoy interesting plants/plantings, admire the garden art and perhaps enjoy a home cooked meal delivered to your cottage. John has engineering in his genes and is constantly working on ways to defy gravity, whether it be constructing dry stone walls or possum proofing the vege garden. His abilities shine here. John and Robyn purchased the block in 2000 and have continued on the journey since. "We love this area, the creatures that live here provide hours of joy and entertainment for birdwatchers and wildlife fans alike." The studios (2 only), were opened in 2015 and provide a unique opportunity to enjoy nature up close and personal. Blue Crane cottage enjoys the advantage of the birdlife visiting the dam closeby and Fern Cottage enjoys the vista of the dense fernery below the tallow wood trees. The studios provide an idyllic opportunity to reconnect with nature, watch birdlife and wildlife go about their daily routine and find stillness and peace amongst nature, without sacrificing the comforts of home. The veranda space is perfect for summer breezes as you look into the forest at tree level. Koalas, wallabies, bandicoots, gliders - all types of animals live here and the birds are a delight with tree hollows and artificial nest boxes close by. The cottages share a garden gazebo/BBQ area and have access to the cool salt pool and beautifully situated hilltop spa - a must do whilst staying. Shower with flexible hose and adjustable rose. Modern designer touches. Complimentary shampoo/conditioner bodywash and moisturiser included. Hairdryer. Soft fluffy bath sheet size towels and robes. Bushland view with glimpses of mountains. Amazing views to the Great Dividing Range from the hilltop spa. Mobile phone reception available outside, limited inside to to steel construction of building. Luxury linen, cotton bamboo sheeting included in price. Convection microwave oven with appropriate cookware provided. Alfoil, gladwrap, papertowel. Condiments as described above. Modern flat screen with Sound bar, free movies. Several free to air channels available. Plentiful, interesting gardens with food plants and unusual plants. Generous covered veranda with seating to enjoy the antics of birds and wildlife. Perfect for nightspotting. We have wheelchair accessible room in our main guesthouse - please enquire. Secluded bushland setting minutes from Canungra where you can get all supplies and enjoy a great coffee. Child free environment. Thoroughly enjoyed our stay. Peaceful & serene surrounds, & exceptional hosts. Thanks Lisa for taking the time to review us. We so enjoyed setting up Fern Cottage to take advantage of the beautiful forest environment and view from the veranda. I also enjoyed the challenge of landscaping the surrounds and John and his bluestone walls are becoming quite a conversation piece. Since your stay we have also put some nestboxes in the trees for guests to watch for furry or feathered friends. And the new covered BBQ area for the cottages is also nearly complete and very convenient. We hope you can come and stay again soon. The Scenic Rim is the home of natural features such as Tamborine National Parks, Cedar Creek Falls, Lamington National Park. We are on food and wine trail Route 16 where you can enjoy winetasting at Albert River Wines. Free reptile show at Bearded Dragon, O'Reilly's Vineyard, Antiques or retail or great coffee at Canungra are close by.